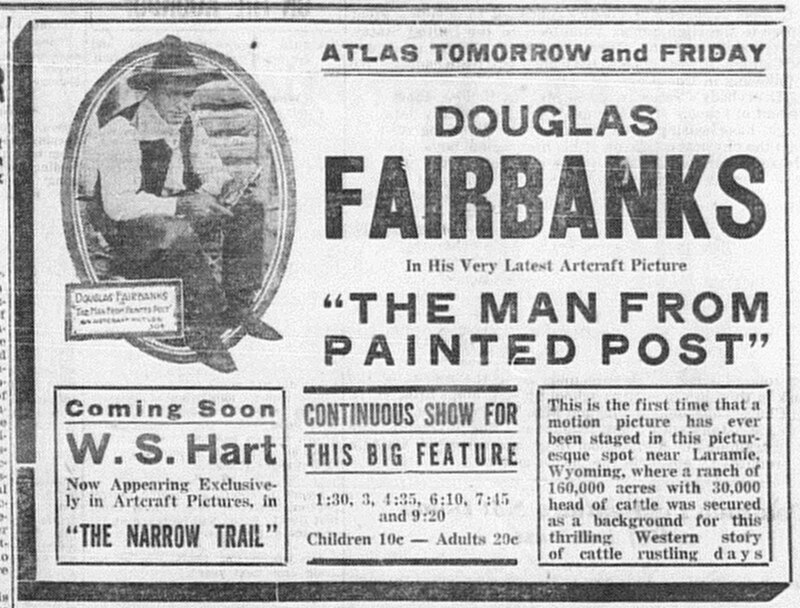 On August 8, 1917, while guns blazed in Europe, silent film and Broadway star Douglas Fairbanks and his troop of actors began filming scenes for his newest movie, “The Man from Painted Post” at the Riverside Ranch near Laramie, Wyoming. They would stay for 2 weeks. The film arrived in Wyoming theatres in mid-October 1917 to record crowds. Theatres around the state, who usually only showed a film twice a day on Friday and Saturday, scheduled double or triple this number to keep up with local demand. Fairbanks had grown up in Denver before moving to New York to pursue an acting career on Broadway. In 1915, he began acting for the camera when it was still being looked down upon by many “serious” actors. His gamble paid off and he was soon one of the biggest names in the blossoming motion picture industry. 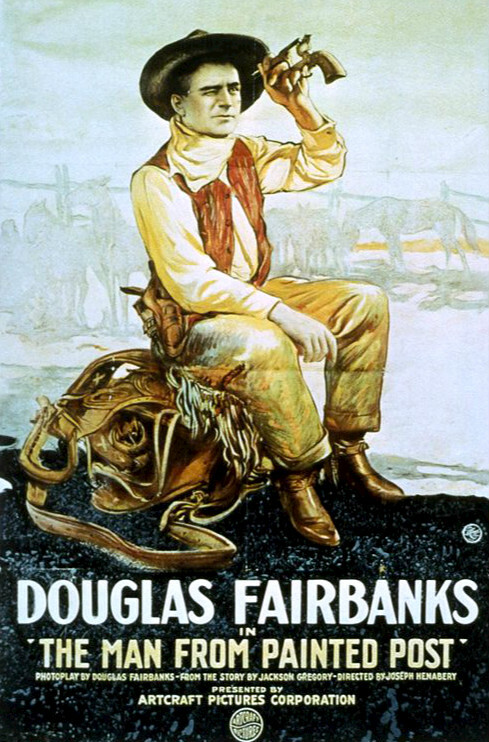 Fairbanks not only acted in “The Man from Painted Post”, originally titled “Handsome/Fancy Jim Sherwood,” he also wrote the screen play and acted as producer for the film. His brother, John, was the general manager of the Fairbanks Company troop. Many big name rodeo cowboys, like Sam Brownell, also made appearances beside the famous actors. The climactic fight scene was shot at the Woods Landing schoolhouse with students playing themselves while Fairbanks fights the “bad guy” for the schoolmarm’s affection. Apparently the cameraman caught some “real” action when a couple of boys also started to brawl. The Laramie Chamber of Commerce took the opportunity to speak with Fairbanks about permanently locating his company in Laramie. The local paper was full of talk of setting up a permanent filming camp and even a “resort” near Woods Landing to cater to the visiting stars. Fairbanks seemed to entertain the idea, mentioning that the location half way between California and New York would certainly be convenient and promised to send a company representative to look into the possibility, but nothing ever came of it.